Wales Women are targeting six points from crucial World Cup qualifying matches against Turkey and Ukraine. The Welsh lie third after three matches in Group 6 behind England and Ukraine, who are both unbeaten. And captain Jess Fishlock believes the tight nature of the group means Wales cannot afford a slip-up. "To be honest the way that it works with the qualifying we really need to get six points," said the Seattle Reign midfielder. "Six points is what we're looking for, that's what we're going for and that's what we're aiming for." Wales have won two of their three matches in qualifying for Canada 2015, with their only defeat coming against runaway leaders England. Wales play Turkey in Eskishehir on Friday, 4 April and Ukraine in Llanelli on Wednesday, 9 April. With one team qualifying by right and the second placed team going into a play-off, Fishlock believes Wales cannot afford to lose ground on Ukraine in particular. "We want to keep building in the campaign," She said. "That's something we do well, we build momentum and that's something that you need to do in these campaigns [because] they go over such a long period of time." 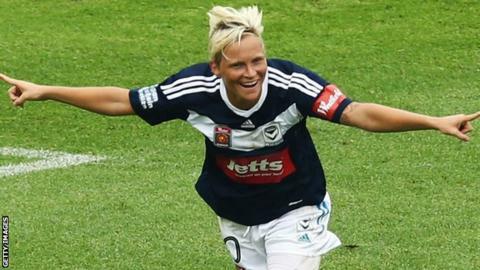 Fishlock, 27, faced a daunting journey before even meeting up with the Wales team at Gatwick airport on Monday. A flight from Seattle to Las Vegas was followed by one to London with an hour's break before boarding a plane for Istanbul. "The Football Association of Wales are great with the travel arrangements, but it will be 36 hours travelling by the time we arrive in Turkey," added Fishlock. In spite of the travelling, Fishlock is in confident mood after the promising start Wales have made to the qualifying campaign under manager Jarmo Matikainen. "I think [the squad] definitely has the most character [of any] I've ever been in, I mean the strength of character that we've had and built on," she said. "We always seem to have a little bit of bad luck when it comes to getting a squad and keeping that together, but right now we're in a good place."